Microsoft Word is mainly used for typing out standard documents that then receive some basic formatting by the user – yet with each release of the word processing application, Microsoft have introduced an always improving selection of templates, perfect for a wide selection of document types. These templates can be used to save a lot of time – and among them is a selection of documents suitable for writing out recipes. Of course, we all have our own requirements when creating documents in Microsoft Word. Thankfully, over the years since Microsoft Word 97 was released, there are many recipe document templates available. Available for Word 97 or later (so if you’re using Word 2000, Word XP, Word 2003 or Word 2007 you can use these templates) recipe card templates are available from Microsoft’s Office Online website. 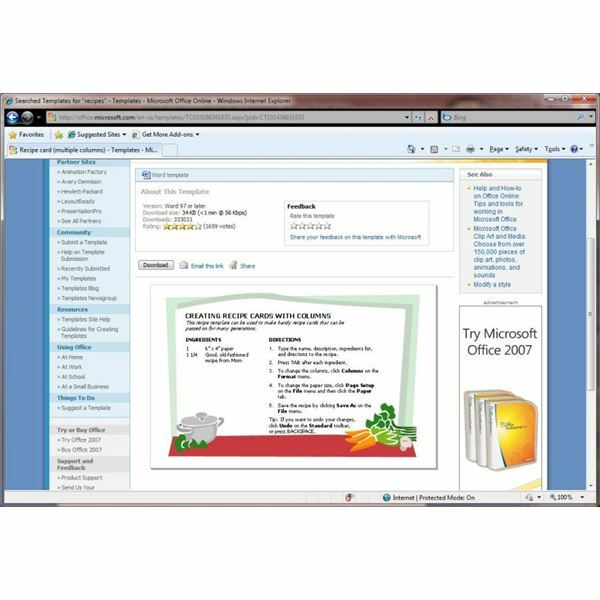 To see what’s available, visit this link office.microsoft.com and type recipes in the search box – this will display a list of recipe card templates and even a cookbook template. There are many templates to choose from, so go through the list, check the descriptions and perhaps have a look at the previews. Once you have selected a suitable template, click on it to view the preview and click the Download button. You will then be asked to Accept the download terms and conditions; also notice that you will need to have cookies enabled in your browser for the download to succeed. To avoid problems downloading, you should use Internet Explorer as your browser for this task. You will then be asked where to save the template – by default, Windows will show you the main template location. Once you have saved the template and it has downloaded, Word will open, displaying the template that you can now use to begin recording your recipes! To use the downloaded template, open a New document, and select the recipe template from My Templates. Once the template has opened, you can begin using it to record your own recipe. The recipe document template is preset, meaning that the position of the title and width of the columns are fixed – until you change them. As such, you can begin overtyping the words that are already displayed as part of the template layout. Often templates include instructions within the layout, so it might be a good idea to read what is displayed in the template before continuing, as this may give you some extra information specific to that template. As soon as you are ready, Save the file – Word will prompt you to choose a filename. You’re now ready to start recording your own culinary creations with Microsoft Word recipe templates! Want more Word templates? Check out other Bright Hub articles with links and instructions on using templates in MS Word, such as Microsoft Word Templates to Make Meeting Agendas, How to Make a Calendar Using a Template in Microsoft Word and How to Download Microsoft Word Templates.